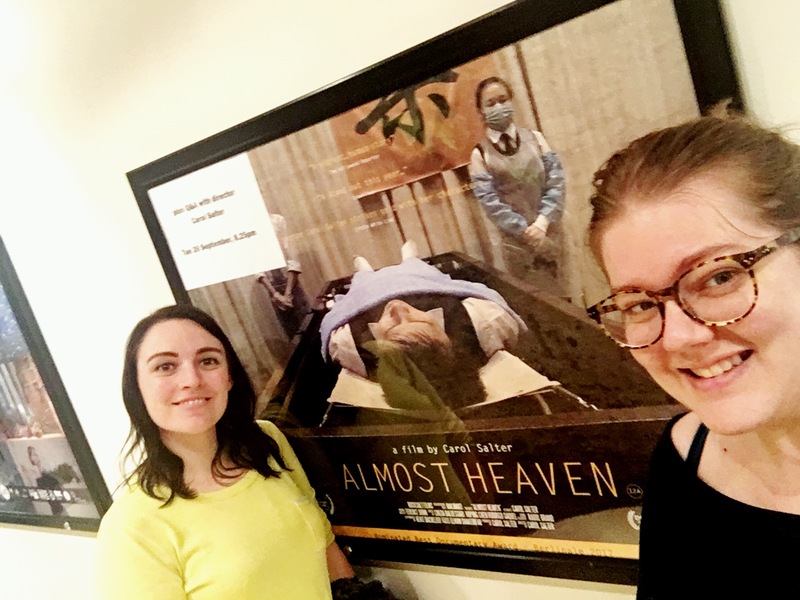 On Tuesday evening I went along to a screening of Almost Heaven, a documentary by Carol Salter of Rock Salt Films with my friend Laura. Worth mentioning a different friend Laura to the one I went to the museums with. It just so happens that I know quite a few Lauras, and I’ve never met a Laura I didn’t like. Fact. Almost Heaven is about 17 year-old Ying Ling, a girl who goes to work in a Funeral Parlour a long way from home in a strange city. When she starts, she has an infectious smile and a relatable fear of ghosts hanging out in the corridors of the building where she works. She seeks to become braver but doesn’t know how, so she asks everyone she can, including a search engine on her phone, for advice. I liked this film because it showed her life with the background of the funeral home as a setting rather than a focus. Interestingly, Carol Salter who was present for a Q&A at the end of the screening said that she decided to make this film as a way of dealing with confronting death in her own experiences. This struck a chord with me, as it relates to why I am doing what I am doing and trying to get people talking about the subject of death. Or, at least, that by thinking about it a little bit more it becomes more approachable and acceptable to do so. The whole feature was filmed by Carol and one camera, and I think it’s easy to understand how surrounding herself with this project could help her. Carol also did briefly touch upon the new movement of (mainly) women trying to get people talking about death more and the possibilities it was opening, she didn’t explicitly say Death Positivity but I’m pretty certain that is what she was referring to. The thing I found most interesting about this documentary was the nature of the funeral business in China and how it was dealt with by the people working in the funeral parlour and the clients who were there when this was filmed. How the deceased are treated and the difference between the traditions I know from being in this country and the similarities of how these are practiced. This felt quite natural because of not being the focus, they were just as things happening in the film that Ying Ling was learning as she progressed her venture into the funeral business. Carol did mention in the Q&A that she thought it was fair to say that the funerary practices in the U.K. are still solidly grounded in Victorian era traditions and this forms a lot of the way in which we deal with death. She did not want the Chinese practices to be thoroughly described because she was not sure about them herself, but rather she intended to give an insight, like she had experienced, of the way in which they deal with their deceased. I don’t want to spoil this for anyone who wants to see it too much, but I think being able to feel for Ying Ling and her situation was the great thing about this, and I’m fairly certain this was the intended focal subject matter rather than the funeral business she was immersed in. Yet still, we should feel privileged for a rare glimpse into this industry and the people who experience it either from the point of view from those working or the deceased and their families. I’m not sure where, or when, or for how long this film will be available but check it out if you find it in time! I am also very aware that I am a liar because I said in my last post you wouldn’t hear from me until next week but I’m sure you’ll get over it.